Stewart Duffus was originally a member of Arbroath Harriers who, after winning the Scottish Junior Cross Country Championship joined Clydesdale Harriers. He had a glittering career on the track and over the country and was undoubtedly a superb talent. However he was involved in various scandals involving money – accepting travelling expenses, impersonating other athletes and so on – and ended his career a disgraced athlete. We should not get ahead of ourselves though. His career came first. He burst on to the National scene when he won the National Junior Cross Country Championships in 1893 in the colours of the unfashionable Arbroath Harriers. As a Senior the following year he was second to Clydesdale’s Andrew Hannah after a hard fought race in which he was the only runner able to stay with the great man. 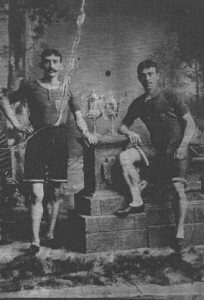 In 1895 he was again second – this time to Edinburgh’s P Hay and again there were only two runners together at the finish with Duffus being outsprinted in the race for the line. 1894 was repeated in 1896 when he was behind Andrew Hannah at the finish after a hard race over a heavy course with a lot of ploughed land. The club at that time awarded gold medals and badges for particularly outstanding performances and the Committee Minute for September 1896 reported: Mr Stewart Duffus was granted a gold medal for establishing a record in the 4 Miles Championship in the time of 20 minutes 10 4/5th seconds and a silver medal for winning a mile race at Maybole on 17th July in 4 min 29 sec off 35 yards start. His claim for a record medal in the Three Miles Race at the Rangers Sports on 1st August in the time of 15 minutes 6 3/5th seconds was held over formally till the Union had passed the performance.” On the track there were many fine races over one, four and ten miles but his only SAAA victory was in the four miles in 1896 in a Scottish record of 20:10.8 for which the above claim was made.. In 1897, not only was he a club member but his brother James Smart Duffus had joined the club in January of that year. After three years in second place he went one better in 1897 when he won the national Senior Championship for the first time. 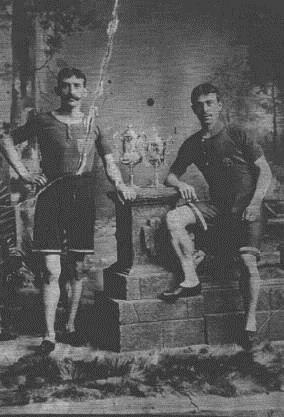 In 1898 it was a reversion to second place: he was returning from a six week lay off due to injury but was aided by his team mate William Robertson losing ground due to torn shorts (!) but just failed to win gold. 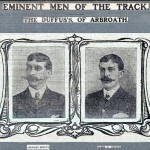 He was really doing well and was highly thought of at this time and was winning races all over the country: in August 1898 the team of WS Robertson (1st), John S Duffus (2nd) and Stewart Duffus won the gold cup, three gold medals and three special prizes at the Berwick team race. In September 1898 he was elected club captain at the AGM with John S Duffus vice captain. The Committee nominated him as HQ Section Two Team Leader in September that year and another family member – cousin JH Duffus – was elected to the club in October. An active Committee Member he was asked by the Committee to visit the Assistant Secretary who had resigned two months after election and enquire further into the matter and if possible persuade him to take up his duties again. Everything was going well for him. Events to be described below were to prevent his racing the following year. The payment of athletics expenses, including hotel bills, was general but only to athletes coming from a distance such as England. Roping was spreading and this, together with the betting, was found to be demoralising amateur sport. Athletes and others giving evidence had been guaranteed immunity from any action against them. The findings however led to new definitions of amateurism and new rules dealing with the payment of expenses. The next furore on the subject was not long in coming. 4. JH Duffus be suspended for failing to appear before the sub-committee to give evidence. Robertson, S Duffus, Rodger and Mitchell had been Scottish champions and record holders and their departure from the scene was a loss to the sport. The moral demands on athletes were high. The ultimate punishment for his errors was banishment from the sport. He could not appeal, he could not hold any office and could not coach or have any involvement in the sport thereafter. Maybe harsh but possibly a model for dealing with drug cheats in the twenty first century. As falls go, they don’t come much more dramatic than that. Thanks Alex for the welcome addition to the profile.